Nowadays there are a great many people who, upon encountering the name Rubinstein, would only think automatically of the Polish pianist, the late Artur Rubinstein. However, our subject (no relation) is the once world-renowned Russian composer and pianist Anton Grigoryevich Rubinstein who was born in Balta Podalia (Ukraine) on 28 November 1829. He died in Peterhof on 20 November 1894. In his lifetime, Anton Rubinstein was highly regarded as a pianist, as a conductor, as the first great Russian teacher whose methods and administration are still echoed in the modern Russian musical institutions, and as a prolific composer. Although he was certainly a conservative composer, he was also an influential one, and those who are lucky enough to unearth any of the once famous large-scale works can immediately see passages which were imitated by younger composers whose fame eventually eclipsed Rubinstein’s. Although the Romantic revival seems largely to have passed Rubinstein by—he is still recalled for a small handful of piano pieces and songs—there is always a case for reviving music which, in its time, was so well respected and which, in any case, is agreeable and well made. Rubinstein’s own piano playing was one reason for the original success of his sonatas and concertos. He was, by general concensus, the greatest pianist since Liszt, and there are many accounts of performances which ranged from deeply sensitive to electrifying, though unfortunately he died just a little too early to leave us any recordings. His repertoire was enormous and all-embracing, and his most famous series of concerts was the cycle of seven Historical Recitals with which he toured Europe in 1885. These programmes began with early keyboard music of the English, French, Italian and German schools, moving through all the important Classical and early Romantic composers and ending with a selection of Russian piano music. Schumann and Chopin featured above all others. Only early music of Liszt appeared (Rubinstein felt that Liszt’s later forays into modern harmony were unacceptable) and Brahms was not featured at all (he loathed Brahms’s music, partly because Brahms had borrowed a great many ideas from him without acknowledgement, and had then written a great many unkind things about the very pieces by which he had been influenced). Cutting himself off from both the conservative school of European music as exemplified by Brahms, and the modern school as exemplified by Liszt, Rubinstein left himself somewhat isolated as a composer, all the more so because he regarded all of his Russian forerunners as distinctly amateur. He mistrusted the growing school of Nationalism and took a very long time to appreciate that Tchaikovsky had any worth. He thought all along that real music died with Schumann and Chopin. Not surprisingly, then, he was a very conservative composer indeed. But this had its virtues. While the Russian school was emerging in something of a hit-or-miss fashion, Rubinstein, with his thorough German background, brought a great deal of order to chaos. He is revered in all books about Russian music for his abiding interest in rich, broad and highly competent musical education, and of course he will always be remembered for having founded the St Petersburg Conservatory. (His brother Nikolai, an equally old-fashioned academic well remembered for his criticisms of the early works of Tchaikovsky, was the director of the Moscow Conservatory.) Rubinstein believed that all potential Russian composers ought to be given better grounding in the essentials of musical language—up to this point the great Classical forms of European music, opera excluded, were almost non-existent in Russia. Anton Rubinstein was Russian of German extraction, and Christian by virtue of his progenitors’ forcible conversion from Judaism. This admixture served his critics well, as Rubinstein himself admitted when he wrote of his being neither fish nor fowl: ‘For the Russians I am a German, for the Germans a Russian; for the Jews I am a Christian, for the Christians a Jew’ (Autobiography). But it was also the reason for his versatility and solid West-European cultural standards. He was certainly the first really professional Russian composer—precursors like Glinka and Dargomizhky were dilatory tinkers by comparison (at least in technical terms, even if they were more characteristically individual)—and set the example in standards of workmanship by a long, very even and, on the whole, attractive series of symphonies, concertos, sonatas, string quartets, songs, operas and oratorios. In between composing his vast output he travelled broadly, knew all the important musicians of his day, played the piano, had time to found and direct the St Petersburg Conservatory, and made for himself a place of unchallenged importance in the Russian musical life of the day. It was Rubinstein who wrote the first significant body of Russian sonatas, concertos, symphonies and string quartets, and whose very industry and competence were an inspiration to composers like Tchaikovsky, who found the Nationalist school of Balakirev and his followers to be somewhat amateur and lacking in discipline. Sadly, Russians did not appreciate his cosmopolitan music for long, and Western Europe criticized him for his sheer Mendelssohnian fluency. While there is justification for some of the criticism, and while it is certain that Rubinstein was no progressive, it is less than just that someone whose influence as a composer was so broad should have been so easily neglected. To mention but one example of his influence: the well-wrought and once-beloved Piano Concerto No 4 is obviously echoed in works as different as the first concerto of Tchaikovsky and the second of Brahms. 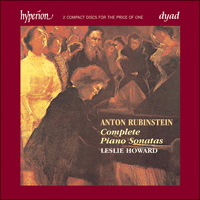 Of course, Rubinstein’s musical style shows the heavy influence of Mendelssohn and Schumann, but every now and then a little of Russia breaks through—for example in songs like Der Asra or ‘Gold rolls here before me’ (wonderfully recorded by Chaliapin), in the beautiful treatment of a folk song in the finale of the Piano Quartet, and in the explosive finale of the Piano Sonata No 1. The four piano sonatas are excellent representations of Rubinstein’s style and, for all the signs of derivation from time to time, they are forthright, effective, and often original pieces. The first important fact about this work is simply that it is probably the earliest piano sonata to be composed by a Russian. It dates from around 1847/8 and, as the product of a teenager who must have been quite a pianist already, it is beyond criticism. It has a youthful naivety about it, with echoes of Mendelssohn as well as a certain brashness which Tchaikovsky was to show in his early keyboard works. Typically, Rubinstein uses no Russian folk material, but some pages of this sonata betray an obviously Russian origin. The first movement, Allegro appassionato, is in a brisk 2/4 and the opening builds through a series of grand gestures into a strong repetition of the first theme in triplet octaves. The tremolos and arpeggios which bind the movement together lead to the second subject and testify to Rubinstein’s easy capacity for fluent melody. The development moves to the remote key of F sharp major where the constantly moving accompaniment stops—as it will again when the second subject returns in the recapitulation. The movement ends quietly and seriously after a further reference to the opening phrase. The Andante largamente is a simple tripartite conception which launches immediately into its long principal melody in C major. The placid mood becomes gradually ruffled during the central section in A minor, where dotted rhythms are contrasted with pulsating triplets. A delicate modulation (German augmented sixth to tonic 6/4, for those who care about such things) ushers in the principal theme over a florid accompaniment, and the last few bars recall the middle section. The scherzo, Moderato, is a perky piece in A minor with a tastefully ornamented melody which makes much of the alternative possibilities between G sharp and G natural. The second section, which is repeated, spends some time in C major before returning to A minor and a fortissimo change of gear from 3/8 to four bars of 2/8—something which would have delighted Schumann. The little trio in A major subjects its winsome tune to some quite harmless contrapuntal imitation. The finale, Moderato con fuoco, is the strongest movement. After a preliminary statement of the theme, a grand Russian outburst reintroduces it in octaves with rushing triplet accompaniment. These rhythms dominate the movement, despite the first appearance of the lyrical second subject—an excellent melody by any standards. The entire development section is given over to a fugue on the first theme, but although young Anton Grigoryevich flexes his academic muscles once or twice the fugal manner actually assists the enormous forward propulsion of the movement. When the second theme returns, the irrepressible rhythm of the fugue continues in the bass, to be displaced only by the grandest possible repeat of this theme, with repeated chords and rich arpeggios, leading (through a harmonic progression that would become Tchaikovsky’s favourite method of heralding a climax) to an enthusiastic conclusion. Rubinstein’s second sonata was composed between 1852 and 1854 and was published in 1855. The shortest of the four sonatas, it replaces the conventional slow movement and scherzo with a theme and variations. Unlike the other sonatas, the second begins with a rather tentative version of the main theme and it is only after subsidiary material, derived from rapidly arpeggiated chords, that the melody appears in full strength. Also a reversal of the conventional role is the fanfare-like second subject. The development is straightforward enough, with excursions into E flat minor and A flat minor, then A major and E major before an enharmonic modulation almost violently restores the home key. The theme and variations, which Rubinstein often played separately, form a graceful intermezzo, simple and lyrical until the Schumannesque third variation alters the mood. After the mild solemnity imposed by the minor key of the fourth variation, a short coda restores the tranquillity of the beginning. The finale is another movement in sonata form, characterized by a favourite Rubinstein device of constant very rapid triplets. The excellent second subject is hurried aside and the exposition is repeated. The development relies rather heavily on sequential repetition of phrases from both main themes, but the return is handled very deftly, with almost orchestral colouring. Mendelssohn is clearly the model for the nonetheless effective coda. Judging from Rubinstein’s own choice of programmes for the Historical Recitals with which he toured Europe towards the end of his life, the third sonata was his favourite. He included it complete, along with the scherzo of the fourth, and last, sonata and the beautiful variations of the second. Composed around 1853/4 (it is nearly impossible to place Rubinstein’s dates on composition any closer than this), the F major sonata certainly seems conceived for its own composer’s performance. It is characterized by its seriousness and strength as well as the broad scope of the piano writing (within the boundaries of the, by then, conservative tradition of Mendelssohn and Schumann but with more than the occasional anticipation of Brahms). The two themes of the opening Allegro risoluto e con fuoco are both economically devised, and bear the customary masculine/feminine relationship of the Romantics’ interpretation of Classical sonata form. One phrase of the first theme also does duty for linking material and eventually generates a counter-theme to the return of the second theme. Altogether an imposing piece, this movement also shows a good many strokes of a harmonic personality which, if not unnervingly original, is at least recognizably individual. The Allegretto con moto is a little masterpiece. Cast in 2/4, in A minor, and marked piano and misterioso, this march-scherzo is full of delicate contrasts between legato and staccato, which continue through the largely half-lit trio section with its succession of almost primitive cadences which might have delighted Mahler. The intensely romantic Andante at once recalls Schumann and anticipates Brahms. Essentially monothematic (the middle section—moving to E flat minor from the original C major—derives from the third phrase of the theme), the movement is beautifully balanced between expected and unpredictable changes of harmony. In the more than a quarter of a century which separates the third from the fourth of the Rubinstein sonatas (the fourth appeared in 1880) lie only two of his major works for piano—the Fantasy, Opus 77, and the Theme and Variations, Opus 88, both of which are larger than any of the earlier sonatas and show a very different weight of thought from the dozens of character pieces which otherwise fill the Rubinstein piano œuvre. The fourth sonata turns out to be in this grand mould, on a much broader scale than the others, and is almost leisurely in its expansiveness. There are two parts to the first theme of the Moderato con moto: a strong rhythmic motif marked appassionato e con espressione and a gentler rising theme accompanied by triplet chords. An animated transition passage leads to the second group of themes: a lyrical melody which is immediately extended and developed, and a codetta which contains two more melodic ideas, the second of which introduces the development after the exposition is repeated. All the themes other than the lyrical second subject play a part in the development, and the opening theme is treated fugally. The regular recapitulation is rounded off with a short coda. The scherzo is a very powerful affair whose skittish moments are generally interrupted by gruff cadences on the off beats, and there is some occasional mildly experimental dissonance. The calmer trio section curiously calls to mind the Grieg of the Lyric Pieces, with its two-bar phrases and delicate syncopations. The slow movement is very generous with melody—the exposition contains seven distinct themes, three in the home key of F major before a more animated theme in 5/8 introduces D flat. A modulatory theme leads to the second subject and codetta in C major. Development is confined to the first of the themes, but the recapitulation introduces many variations in texture and tonality. A second development turns out to be a long valediction on the first subject group. The finale is a very busy moto perpetuo with a theme appearing in octaves in the bass before it undergoes the first of many transformations. A brief attempt at a lyrical second theme is doomed by the insistent return of the first for development, but a more expressive section intervenes before the recapitulation, in which the second subject finally takes wing before precipitating headlong into the conclusion. Aujourd’hui, pour beaucoup de gens le nom de Rubinstein évoque automatiquement la mémoire du pianiste polonais, Artur Rubinstein. Cependant, ce n’est pas de lui dont il est question ici, mais du compositeur et pianiste russe Anton Gregorievitch Rubinstein (aucun lien de parenté avec son homonyme) né le 28 novembre 1829 à Balta Podalia (Ukraine) et mort à Peterhof le 20 novembre 1894. De son vivant, Anton Rubinstein fut très estimé en tant que pianiste, chef d’orchestre et aussi pour avoir été un compositeur prolifique. De plus on saluait en lui le premier grand professeur russe dont les méthodes et l’œuvre d’organisateur trouvent encore aujourd’hui un écho dans les institutions musicales de Russie. Bien qu’il ait été sans aucun doute, en tant que compositeur, un champion de l’académisme, il eut cependant une influence énorme, et pour ceux qui ont maintenant la chance de redécouvrir une de ses grandes compositions autrefois fameuses, il est possible aussitôt de trouver des passages qui ont été imité par des compositeurs plus jeunes et qui l’ont, par la suite, éclipsé. Tandis qu’il semble avoir largement été laissé de côté lors du regain d’intérêt pour le romantisme—on se souvient de lui surtout pour quelques pièces de piano et quelques chansons—on peut néanmoins facilement trouver une justification pour faire revivre sa musique qui, à son époque, était si respectée et qui est en tout cas bien faite et agréable à écouter. C’est d’abord en raison de sa réputation de pianiste que les sonates et les concertos de Rubinstein eurent du succès. Il était de l’avis général le plus grand pianiste depuis Liszt et on a de nombreux comptes rendus de ses concerts qui vont l’éloge d’une profonde sensibilité jusqu’aux plus grands débordements d’enthousiasme. On peut regretter qu’il soit mort un tout petit peu trop tôt pour laisser à la postérité des enregistrements. Il avait un énorme répertoire qui s’étendait à tous les genres. Sa plus fameuse série de concerts comprenait un cycle de sept «Récitals historiques» qu’il présenta dans toute l’Europe en 1885. Ces programmes commençaient par des œuvres pour clavier de musique ancienne des écoles françaises, anglaises, italiennes et allemandes, pour ensuite passer à tous les compositeurs importants du classicisme et des débuts du romantisme, et pour enfin se terminer par un choix de pièces de piano de compositeurs russes. Schumann et Chopin y figuraient au premièr rang avant tout autre compositeur. Il jouait seulement les pièces de Liszt les plus anciennes (les œuvres récentes étaient écartées en raison des audaces harmoniques qu’il jugeait inacceptables) et ne jouait aucune piéce de Brahms (il détestait la musique de ce dernier, d’une part parce que celui-ci lui avait emprunté beaucoup d’idées sans le reconnaître, et d’autre part parce que Brahms lui-même avait écrit des commentaires peu aimables à propos de ces mêmes pièces dont il avait subi l’influence). Se coupant, ainsi, tout à la fois du courant conservateur de la musique européenne dont Brahms était le représentant le plus célèbre et de la tendance moderniste représentée par Liszt, Rubinstein se retrouvait ainsi quelque peu isolé en tant que compositeur et cela d’autant plus qu’il considérait tous ses prédécesseurs russes comme des amateurs. Il se méfiait de l’école nationale naissante et mis beaucoup de temps à reconnaître à Tchaïkovsky quelque mérite. Il resta toujours convaincu que toute véritable musique était morte avec Schumann et Chopin. Ce qui en fait n’a rien d’étonnant puisqu’il était un compositeur des plus académiques. Mais cela avait aussi ses avantages: alors que l’école russe émergeait au coup par coup au gré de tentatives plus ou moins heureuses, Rubinstein, avec sa solide formation allemande, put remettre un peu d’ordre dans ce bouillonnement chaotique. Dans tous les ouvrages qui traitent de la musique russe, on parle avec beaucoup de respect de son intérêt profond, qui ne s’est jamais démenti, pour tout ce qui touche à l’éducation musicale, celle-ci devant être la plus riche, la plus complète, et du plus haut niveau technique possible. Naturellement, on se souvient maintenant de lui comme étant le fondateur du conservatoire de Saint-Pétersbourg. (Son frère, Nicolaï, lui aussi un champion démodé de l’académisme, dont on garde en mémoire les critiques acerbes des premières œuvres de Tchaïkovsky, était le directeur du conservatoire de Moscou.) Rubinstein était persuadé que tous les futurs compositeurs russes devaient bénéficier d’une meilleure éducation en ce qui concerne les fondements du langage musical—les grandes formes classiques de la musique européenne, hormis l’opéra, étaient jusqu’alors pratiquement inexistantes en Russie. Anton Rubinstein était un russe de souche allemande et un chrétien en raison de la conversion forcée de ses parents du judaïsme. Ce mélange a été très utile à ses détracteurs, et Rubinstein en était conscient lui-même: «Pour les russes je suis allemand, pour les allemands je suis russe; pour les juifs je suis chrétien, pour les chrétiens je suis juif» (écrit-il dans son autobiographie). Mais ceci explique aussi sa versatilité et sa solide culture occidentale. Il fut certainement le premier véritable compositeur professionnel russe—des précurseurs comme Glinka et Dargomyjky restaient des bricoleurs inspirés (au moins sur le plan technique même s’ils avaient une personnalité plus marquée) et il a placé la barre beaucoup plus haut en ce qui concerne le métier de compositeur et cela dans une œuvre qui comprend une longue série de qualité très égale et, dans l’ensemble très séduisante, de symphonies, de concertos, de sonates, de quatuors à cordes, de chansons, d’opéras et d’oratorios. Tout au long de sa vie, la composition de cette œuvre de vaste dimension fut entrecoupée de longs voyages. Il rencontra tous les musiciens les plus importants de son époque, jouait du piano, et trouva le temps de fonder et de diriger le conservatoire de Saint-Pétersbourg, et cela tout en se créant une position sans égale dans la vie musicale russe de son temps. C’est Rubinstein qui composa en Russie le premier ensemble significatif de sonates, de concertos, de symphonies et de quatuors à cordes dont la facture appliquée et compétente fut un exemple pour des compositeurs comme Tchaïkovsky qui trouvait que l’école nationaliste de Balakirev et de ses émules avait un parfum d’amateurisme et manquait de discipline. Malheureusement le public russe n’a pas continué à apprécier sa musique pour très longtemps, alors qu’en Europe occidentale on lui a reproché sa manière facile à la Mendelssohn. Et même si certaines de ces critiques sont justifiées, et qu’il est prouvé qu’il n’avait rien d’un novateur, il semble cependant injuste qu’un compositeur ayant eu une influence si importante ait été si facilement rélégué dans l’ombre. Pour montrer l’étendue de cette influence, il suffit de citer un seul exemple, en l’occurrence, son IVe concerto de piano si finement travaillé et autrefois une œuvre que le public adorait. On trouve des échos de ce concerto dans des œuvres aussi différentes que le Ier concerto pour piano de Tchaïkovsky et le IIe concerto de Brahms. Bien entendu, le style de Rubinstein révèle la lourde influence de Mendelssohn et de Schumann, mais de temps en temps un petit quelque chose de la Russie parvient à faire surface: par exemple dans des mélodies comme Der Asra (il existe un merveilleux enregistrement de Chaliapine) ou encore le très bel arrangement d’une chanson populaire russe dans le finale du quatuor pour cordes et piano et aussi dans le finale explosif de la Ie sonate pour piano. Les quatres sonates pour piano constituent une excellente illustration du style de Rubinstein, et bien que parfois il y ait des éléments qui donnent l’impression d’un produit dérivé, ce sont des pièces directes, efficaces, et souvent originales. Tout d’abord, la première chose importante à remarquer à propos de cette œuvre, c’est qu’il s’agit probablement de la première sonate à avoir été composée par un russe. Elle date environ des années 1847/8 et comme c’est l’œuvre d’un jeune homme qui n’avait pas encore atteint sa vingtième année, tout en étant déjà un pianiste confirmé, elle demeure en toute justice hors du champ d’une critique sérieuse. Elle possède un charme naïf propre à la jeunesse, avec des réminiscences de Mendelssohn, et ne manque pas aussi d’une certaine fougue dont Tchaïkovsky fera aussi preuve dans ses premières œuvres pour piano. De manière typique, Rubinstein n’utilise pas de thème emprunté au folklore mais certaines pages de cette sonate trahissent cependant une origine russe évidente. Le premier mouvement Allegro appassionato est un vif 2/4 et l’ouverture est construite à partir de grands gestes éloquents qui débouchent sur une puissante répétition du premier thème joué en octaves en triolets. Les trémolos et les arpèges qui lient tout le mouvement mènent au second sujet et sont une preuve de l’aisance mélodique de Rubinstein. Le développement nous entraîne dans la tonalité éloignée de fa dièse majeur où le flux constant de l’accompagnement s’interrompt ainsi qu’il le fera encore quand le second sujet revient lors de la réexposition. Le mouvement se termine dans une quiétude sérieuse après une dernière référence à la phrase d’ouverture. L’Andante largamente d’une conception simple en trois parties commence immédiatement par la longue mélodie principale en do majeur. L’humeur placide du début se trouble graduellement durant la section centrale en la mineur où des rythmes pointés sont contrastés avec une pulsation en triolets. Une délicate modulation (d’une sixte augmentée allemande au second renversement de l’accord de tonique) réintroduit le thème principal enjolivé d’un accompagnement fleuri; les dernières mesures sont un rappel de la section centrale. Le scherzo Moderato est une pièce pleine d’entrain avec une mélodie ornementée avec beaucoup de goût et tirant parti au mieux de l’alternance entre le sol dièse et le sol bécarre. La seconde partie, qui est répetée, reste quelque temps en do majeur avant de revenir en la mineur avec un changement de tempo fortissimo passant de 3/8 à 2/8—une idée qui aurait ravi Schumann. Le petit trio voit son attrayante mélodie sujette à quelques imitations contrapuntiques sans conséquence. Le finale Moderato con fuoco est le mouvement le plus fort. Après une exposition préliminaire du thème, celui-ci est réintroduit dans une grande envolée en octaves très russe avec un accompagnement en triolets qui s’élance avec précipitation. Ces rythmes dominent le mouvement en dépit du second sujet très lyrique—une excellente mélodie quels que soient les critéres considérés. Une fugue sur le premier thème occupe toute la section du développement, et bien que le jeune Anton Grigorievitch fasse, à quelques reprises, étalage de son savoir-faire académique, en réalité le style fugué contribue parfaitement à la formidable impétuosité du mouvement. Quand le second sujet fait sa réapparition, l’irrépressible mouvement rythmique de la fugue continue dans les basses pour être seulement supplanté par moments par de grandioses répétitions de ce thème, avec des accords répétés et des arpèges somptueux, conduisant à une conclusion passionnée (grâce à une progression harmonique qui deviendra plus tard le procédé favori de Tchaïkovsky pour annoncer le bouquet final). La seconde sonate de Rubinstein fut composée entre 1852 et 1854 et fut publiée en 1855. C’est la plus courte des quatre sonates, et le mouvement lent et le scherzo y sont remplacé par un théme et variations. Contrairement aux autres sonates, la IIe commence par une version plutôt hésitante du thème principal, et c’est seulement après avoir introduit des éléments secondaires dérivés d’accords rapidement arpégés que la mélodie apparaît dans sa plénitude. Le second sujet, en forme de fanfare, présente ainsi un caractère qui est en opposition à son rôle traditionnel. Le développement est relativement simple avec des incursions dans les tonalités de mi bémol mineur et la bémol mineur, puis la majeur et mi majeur, avant qu’une modulation enharmonique ne rétablisse, presque avec violence, la tonalité principale. Le mouvement Thème et variations, que Rubinstein interpréta souvent séparément, forme un gracieux intermezzo, simple et lyrique jusqu’à ce que la très schumanniènne troisième variation vienne en altérer l’humeur. Après le léger moment de solennité imposée par la tonalité mineure dans la quatrième variation, une courte coda restaure la quiétude du commencement. Le finale est un autre mouvement en forme sonate, caractérisé par un procédé favori de Rubinstein: à savoir l’utilisation continuelle de triolets très rapides. L’excellent second thème est rapidement laissé de côté pour répéter l’exposition. Le développement a recours assez lourdement à maintes répétitions en séquences de phrases des deux thèmes principaux, mais la réexposition est agencée avec beaucoup de dextérité avec une coloration presque orchestrale. Mendelssohn a clairement servi de modèle pour la coda; elle est néanmoins très efficace. Si l’on en juge par le propre choix de Rubinstein pour les programmes de ses «Récitals historiques» avec lesquels il parcourut l’Europe vers la fin de sa vie, la IIIe sonate était sa préférée. Elle était programmée dans son intégralité à côté du scherzo de la IVe et dernière sonate et des belles variations de la IIe. Composée aux alentours de 1853/4 (il est impossible de situer avec plus de précision les dates de compositions des œuvres de Rubinstein), la sonate en fa majeur semble certainement avoir été conçue pour les propres récitals du compositeur. Elle se caractérise par un ton sérieux, beaucoup de force et également par le grand registre de l’écriture pianistique (dans les limites bien sûr de la tradition, à cette époque, conservatrice de Schumann et Mendelssohn. Aussi présente-elle plus que de simples avancées occasionnelles vers Brahms). Les deux thèmes du mouvement d’ouverture Allegro risoluto et con fuoco sont tous les deux agencés avec beaucoup d’économie de moyens et marqués par l’opposition traditionnelle masculin/féminin de l’interprétation romantique de la forme sonate classique. Une phrase du premier thème sert aussi de matériel de liaison, pour générer en définitive un contre sujet au moment du retour du thème. Somme toute, une pièce imposante, ce mouvement révéle un grand nombre de traits harmoniques qui ne sont peut-être pas d’une nouveauté déconcertante, mais montrent une personnalité originale. L’Allegretto con moto est un petit chef d’œuvre. À 2/4 et en la mineur avec l’indication piano e misterioso, ce scherzo-marche est marqué par de délicats contrastes entre legato et staccato qui se poursuivent dans le trio, tout en demi-teintes, avec sa succession de cadences quasi primitives qui auraient enchanté Mahler. L’Andante à l’intensité très romantique rappelle immédiatement Schumann et anticipe Brahms. Monothématique pour l’essentiel (la section centrale—passant en mi bémol mineur en provenance du do majeur du début—dérive de la troisième phrase du thème), le mouvement est remarquablement équilibré entre les changements harmoniques attendus et ceux plus imprévisibles. Durant l’intervalle de plus de vingt-cinq ans qui sépare les IIIe et IVe sonates de Rubinstein (la IVe est apparue en 1880) seulement deux œuvres majeures pour piano ont été composées: la Fantaisie op.77 et le Thème et variations op.88. Ces deux pièces sont de plus grande ampleur que les sonates qui les précèdent et révèlent une profondeur de pensée bien différente des dizaines de pièces de caractère qui constituent une grande partie de l’œuvre pour piano de Rubinstein. Il se trouve que la IVe sonate relève de cette même veine grandiose, de dimension bien plus vaste que les sonates précédentes et, qui s’étend, pourrait-on dire, tout à loisir. Le premier thème du Moderato con moto se divise en deux parties: un motif rythmique énergique appassionato e con espressione et un thème ascendant plus calme accompagné par des accords en triolets. Un vif passage de transition mène au deuxième groupe de thèmes: une mélodie lyrique qui est immédiatement rallongée et developpée, et puis une cadence qui présente deux idées mélodiques supplémentaires; la seconde d’entre elles introduisant le développement après que l’exposition eut été répétée. Tous les thèmes autres que le second sujet lyrique jouent un rôle dans le développement, et le thème d’ouverture est traité de manière fuguée. La réexposition régulière s’achève par une courte coda. Le puissant scherzo est une affaire sérieuse dont les moments d’humeur ombrageuse sont généralement interrompus par des cadences brusques à contretemps, et il y a, occasionnellement, quelques recherches timides de dissonnances. Le trio rappelle le Grieg des Pièces lyriques, avec ses phrases de deux mesures et la délicatesse des syncopes. Le mouvement lent est très généreux en mélodies—l’exposition ne contient pas moins de sept thèmes différents. Trois d’entre eux sont dans la tonalité principale de fa majeur, avant qu’un autre, plus animé, à 5/8 n’introduise le ton de ré bémol. Un thème qui module amène le deuxième sujet, puis une codetta en la majeur. Le développement est confié au premier de ces thèmes, mais la réexposition introduit de nombreuses variantes en ce qui concerne les textures et les tonalités. Le finale est un mouvement perpétuel très dense avec le thème apparaissant tout d’abord en octaves dans les basses avant de subir de nombreuses transformations. Un second thème plus lyrique disparaît à peine esquissé pour laisser la place au premier thème qui insiste pour revenir pour le développement. Mais un intermède plus expressif intervient alors avant la réexposition, dans laquelle finalement le second sujet prend son essor avant de se précipiter tête baissée vers la conclusion. Heutzutage denken die meisten Menschen beim Namen Rubinstein unmittelbar an den polnischen Pianisten, den verstorbenen Artur Rubinstein. Unser Künstler dagegen (es besteht keinerlei familiäre Verbindung) ist der einst weltweit anerkannte russische Komponist und Pianist Anton Grigorjewitsch Rubinstein, der am 28. November 1829 in Balta Podalia (Ukraine) geboren wurde und am 20. November 1894 in Peterhof starb. Zu seinen Lebzeiten genoß Anton Rubinstein nicht nur höchste Anerkennung als Pianist, Dirigent und produktiver Komponist, sondern auch als erster großer russischer Lehrer, dessen Methoden und Meisterung auch heute noch in den modernen russischen Musikhochschulen widerhallen. Obwohl er ohne Zweifel ein konservativer Komponist war, besaß er dennoch einen gewissen Einfluß, und jene, die das Glück hatten, eines seiner einst so berühmten umfangreichen Werke ans Licht befördert zu haben, werden in ihnen sofort Passagen erkennen, die von jüngeren Komponisten imitiert wurden, deren Ruhm letztendlich jenen Rubinsteins in den Schatten stellen sollte. Wenn auch das Wiederaufleben der Romantik im großen und ganzen Rubinstein ausgelassen hat—man erinnert sich seiner heute höchstens noch wegen einer Handvoll Klavierstücke und Lieder—kann das Wiederbeleben von Musik, die zu ihrer Zeit sehr verehrt wurde und in jedem Fall wohlklingend und gekonnt komponiert ist, nur begrüßt werden. Rubinsteins eigenes Können auf dem Klavier war einer der Gründe für den ursprünglichen Erfolg seiner Sonaten und Konzerte. Es herrscht allgemeine Übereinstimmung darüber, daß er der größte Pianist nach Liszt war, und die zahlreichen Werke seiner Konzertprogramme reichen von zutiefst einfühlsam bis elektrisierend. Leider starb er etwas zu früh, um uns irgendwelche Aufnahmen zu hinterlassen. Sein Repertoire war enorm und allumfassend, und seine berühmteste Konzertreihe war ein Zyklus aus sieben Historischen Essays, die er 1885 auf Tourneen quer durch Europa vorführte. Diese begannen jeweils mit einer Darstellung des Musikrepertoires für Tasteninstrumente der englischen, französischen, italienischen und deutschen Schulen, in der alle wichtigen klassischen und frühromantischen Komponisten voll zu ihrem Recht kamen und immer mit einer Auswahl russischer Klaviermusik abschloß. Schumann und Chopin waren überragend vertreten, während Liszt nur mit frühen Werken repräsentiert war (Rubinstein fand Liszts spätere Exkurse in die moderne Harmonie kaum akzeptabel), während Brahms überhaupt nicht vorhanden war (er verabscheute die Brahmsche Musik, teilweise deshalb, weil Brahms sehr viele Ideen von Rubinstein übernommen hatte, ohne ihm gebührende Anerkennung zu zollen und des weiteren unschöne Dinge über eben diese Stücke schrieb, die ihn beeinflußt hatten). Anton Rubinstein war ein Russe deutscher Herkunft und trotz der erzwungenen Bekehrung seiner Ahnen zum Christentum ein Jude. Dieser Aspekt war für seine Kritiker ein zusätzliches, gefundes Fressen, und wie Rubinstein selbst einräumte, war er weder „Fisch noch Fleisch“: „Für die Russen bin ich ein Deutscher, für die Deutschen ein Russe; für die Juden bin ich ein Christ, für die Christen ein Jude“ (Autobiographie). Dies war indes die Quelle seiner Vielseitigkeit, und auch seine soliden westeuropäischen, kulturellen Maßstäbe lagen hierin verborgen. Denn ohne Zweifel war er der erste wahrhaft professionelle russische Komponist—Vorgänger wie Glinka und Dargomitzki waren neben ihm nur verspätete Denker (zumindest in technischer Hinsicht, obwohl sie individuell eine große Persönlichkeit ausstrahlten). Er setzte durch eine lange, kontinuierliche und in ihrer Gesamtheit höchst ansprechende Reihe von Sinfonien, Konzerten, Sonaten, Streichquartetten, Liedern, Opern und Oratorien immer wieder musikalische Maßstäbe. Zwischen den einzelnen Kompositionen seines enormen Repertoires unternahm er weite Reisen; er kannte alle wichtigen Musiker seiner Zeit, spielte das Klavier, fand Zeit, das Petersburger Konservatorium zu gründen und zu leiten und machte sich auf unbestrittene Art und Weise für die russische Musikwelt seiner Zeit unentbehrlich. Es war Rubinstein, der die ersten erwähnenswerten russischen Beispiele von Sonaten, Konzerten, Sinfonien und einem Streichquartett schrieb, und eben durch dieses Schaffen und seine Errungenschaften war er Komponisten wie Tschaikowski eine Inspirationsquelle. Die nationale Schule von Balakirew und seinen Anhängern hingegen faßte er als eine Gruppe undisziplinierter Amateure auf. Bedauerlicherweise schätzten die Russen seine kosmopolitische Musik nicht lange, während Westeuropäer seine schier Mendelssohnsche Gewandtheit kritisierten. Indem einige der kritischen Argumente gerechtfertigt waren und sogar die Behauptung geäußert werden kann, daß Rubinstein schwerlich ein Erneuerer war, ist es hingegen kaum gerechtfertigt, einen Komponisten, der einen solchen breiten Einfluß hatte, so sehr zu vernachlässigen. Um nur ein Beispiel seines Einflusses zu nennen: Das wohlgeformte und einst so beliebte vierte Klavierkonzert spiegelt sich zweifellos in so verschiedenen Werken wie dem ersten Klavierkonzert von Tschaikowski und dem zweiten von Brahms wider. Natürlich ist Rubinsteins Stil stark von den Stilen Mendelssohns und Schumanns geprägt, und nur selten kommt etwas Russisches zum Vorschein—wie zum Beispiel in den Liedern Der Asra (in einer herrlichen Aufnahme von Tschaljapin), in der wunderschönen Bearbeitung eines Volksliedes im Finale des Klavierquartetts oder im explosiven Finale der ersten Klaviersonate. Die vier Klaviersonaten zeigen auf hervorragende Art und Weise Rubinsteins Stil, und von den zuweilen auftauchenden Anzeichen einer Imitation abgesehen, sind sie in ihrer unverblümten Direktheit wirkungsvolle und oft originelle Werke. Der erste wichtige Aspekt dieses Werkes ist die Tatsache, daß es wahrscheinlich die erste Sonate ist, die von einem Russen komponiert wurde. Sie geht in die Jahre 1847/8 zurück, und ist als das Werk eines Jugendlichen, der bereits ein außerordentlicher Pianist gewesen sein muß, über jedwede Kritik erhaben. Es strahlt sowohl jugendliche Naivität, die an Mendelssohn erinnert, als auch eine bestimmte ungestüme Heftigkeit aus, die Tschaikowski in seinen frühen Werken für Tasteninstrumente ausdrücken sollte. Recht bezeichnend bedient sich Rubinstein keines russischen Folklorematerials, wenn auch einige Seiten seiner Sonate auf einen russischen Ursprung schließen lassen. Der erste Satz Allegro appassionato ist im flotten Zweivierteltakt gehalten, und der Anfang besteht aus einer Reihe großartiger Gesten in starken Wiederholungen des ersten Themas in Oktavtriolen. Die Tremolos und Arpeggios, die den Satz zusammenhalten, leiten das zweite Thema ein und bestätigen Rubinsteins leichthändige Fähigkeit, fließende Melodien zu schaffen. Die Themendurchführung bewegt sich weiter zur entfernten Tonart Fis-Dur, in der die kontinuierlichdynamische Begleitung aufhört—ein Kunstgriff, der auch bei der Wiederaufnahme des zweiten Themas in der Reprise wiederholt wird. Der Satz endet nach einem weiteren Bezug zur einleitenden Phrase ruhig und gedankenvoll. Dem Andante largamente liegt eine einfache dreiteilige Konzeption zugrunde, und es setzt sofort mit einer langen Hauptmelodie in C-Dur ein. Die gelassene Stimmung wird im zentralen Abschnitt in a-Moll nach und nach aufgerührt, in dem punktierte Rhythmen pulsierenden Triolen gegenübergestellt werden. Eine zarte Modulation (für die, die auf Genauig­keit besonderen Wert legen, in deutschen übermäßigen Sexten zu 6/4 auf der Tonika) führt vor blumiger Begleitung zum Hauptthema, und die letzten Takte rufen den mittleren Abschnitt in Erinnerung. Das Scherzo Moderato ist ein keckes Stück in a-Moll mit einer geschmackvoll verzierten Melodie, die die Alternativen zwischen Gis und G nahezu vollkommen ausschöpft. Der zweite Abschnitt, der wiederholt wird, erklingt eine Weile in C-Dur, ehe die Tonart a-Moll und nach weiteren vier Takten der Zweiachteltakt wiederaufgenommen werden—eine Technik, die Schumann erfreut hätte. Das kleine Trio in A-Dur stellt dann in einer recht harmonischen kontrapunktischen Imitation seine reizende Melodie vor. Das Finale Moderato con fuoco ist der ausdrucksvollste aller Sätze. Nach einer einleitenden Themenvorstellung präsentiert ein großartiger russischer Ausbruch in Oktaven zusammen mit der brausenden Triolenbegleitung dieses Thema erneut. Diese Rhythmen beherrschen den ganzen Satz, trotz des ersten Auftretens des lyrischen zweiten Themas—einer exzellenten, allen Maßstäben gerecht werdenden Melodie! Der gesamte Durchführungsabschnitt wird im ersten Thema von einer Fuge getragen, und wenn auch der junge Anton Grigorjewitsch ein oder zwei mal seine akademischen Muskeln spielen läßt, verstärkt der Fugenstil den enormen Vorwärtstrieb des Satzes noch weiter. Bei der Rückkehr des zweiten Themas setzt der unbezähmbare Fugenrhythmus in der Baßstimme fort, um schließlich von der denkbar prachtvollsten Wiederholung des Themas ersetzt zu werden, mit wiederholten Akkorden und reichen Arpeggios, die (durch eine harmonische Fortschreitung, die später bei Tschaikowski bevorzugter Vorbote eines Höhepunkt werden sollte) zu einem begeisternden Abschluß führt. Rubinsteins zweite Sonate war zwischen 1852 und 1854 komponiert und 1855 veröffentlicht worden. Als kürzeste der vier Sonaten werden hier der herkömmliche langsame Satz und das Scherzo von Themen und Variationen ersetzt. Ungleich seiner anderen Sonaten beginnt die zweite mit einer recht zögerlichen Version des Hauptthemas, und erst nach dem Vorstellen des Nebenmaterials, das von Takten schneller Arpeggios abgeleitet ist, erschallt die Melodie in ihrer vollen Pracht. Auch im fanfarenähnlichen zweiten Thema wird die herkömmliche Form in umgekehrter Reihenfolge gegliedert. Die Durchführung ist recht einfach, mit Exkursen in die Tonarten es- und as-Moll, dann in A-und E-Dur übergehend, ehe eine enharmonische Modulation beinahe leidenschaftlich die Haupttonart wiederherstellt. Der Abschnitt Themen und Variationen, den Rubinstein oft auch als selbstständiges Stück spielte, bildet, bis die Schumannsche dritte Variation einen Stimmungswechsel bewirkt, ein anmutiges Intermezzo von großer Schlichtheit und Lyrik. Nach der sanften Feierlichkeit, die durch die Molltonart der vierten Variation hervorgerufen wird, stellt eine kurze Coda die anfängliche Ausgeglichenheit wieder her. Der abschließende Satz erscheint wiederum in Gestalt einer Sonate, die von Rubinsteins bevorzugtem Stilmittel, den kontinuierlich schneller werdenden Triolen, nur so ausgefüllt ist. Die Themenverarbeitung stützt sich recht stark auf sequenzierende Repetitionen von Phrasen beider Haupt­themen, allerdings geschieht die Rückkehr beinahe ohne orchestrale Klangfarben sehr geschickt, und die Vorlage dieser überaus wirkungsvollen Coda scheint der Komponist ganz unverkennbar bei Mendelssohn gefunden zu haben. Nach Rubinsteins eigener Programmwahl für die Historischen Essays zu urteilen, mit denen er gegen Ende seines Lebens quer durch Europa reiste, war die dritte Sonate sein Lieblingsstück. Er schloß sie in ihrer kompletten Form ein, zusammen mit dem Scherzo seiner vierten und letzten Sonate und den wunderbaren Variationen seiner zweiten. Komponiert um die Jahre 1853/4 (es ist bei Rubinstein nahezu unmöglich, genauere Datenangaben zu machen), ist die Wahrscheinlichkeit groß, daß die Sonate in F-Dur für die eigenen Auftritte des Komponisten geschaffen worden waren. Ihre charakteristischen Merkmale sind sowohl in ihrer Ernsthaftigkeit und Aussagekraft als auch im breiten Spielraum der Klavierkomposition zu finden (die innerhalb der Grenzen gehalten ist, die von der damaligen Tradition Mendelssohns und Schumanns bestimmt wurden, jedoch nicht selten Brahms vorausahnen läßt). Die beiden Themen des eröffnenden Allegro risoluto e con fuoco sind sparsam konzipiert und drücken die übliche maskulin/feminine Beziehung der Interpretation der klassisch-romantischen Sonatenform aus. Eine Phrase des ersten Themas dient als Überbrückungsmaterial und entwickelt bei der Wiederaufnahme des zweiten Themas schließlich eine Gegenmelodie. In seiner Gesamtheit ist es ein beeindruckendes Werk, und dieser Satz zeigt in großem Maße Anzeichen harmonischer Persönlichkeit, die, wenn auch nicht von überwältigender Originalität, zumindest aber von erkennbarer Individualität ist. Das Allegretto con moto ist ein kleines Meisterwerk. Im Zweivierteltakt und a-Moll, markiert mit piano und misterioso, ist dieses marschähnliche Scherzo mit zarten Kontrasten zwischen legato und staccato nur so durchsetzt, die größtenteils durch den leicht finsteren Trioabschnitt mit seiner Folge nahezu primitiver Kadenzen fortsetzen, die Mahler entzückt hätten. Das höchst romantische Andante erinnert unmittelbar an Schumann, verweist indessen aber auch auf Brahms. Seinen Grundzügen nach monothematisch (der mittlere Abschnitt, der sich von es-Moll zur ursprünglichen Durtonart bewegt, stammt aus der dritten Phrase des Themas) ruht der Satz jedoch in einer wunderschönen Balance zwischen erwarteten und unvorhergesehenen Harmoniewechseln. Im Vierteljahrhundert, das zwischen Rubinsteins dritter und vierter Sonate (die vierte erschien 1880) liegt, wurden lediglich zwei seiner großen Werke für Klavier—die Fantasie, Opus 77 und Thema und Variationen, Opus 88—komponiert. Beide sind im Vergleich zu all seinen früheren Sonaten umfangreicher und vermitteln zudem ein völlig anderes Gedankengut als die Dutzende von Charakterwerken, die ansonsten das gesamte Rubinsteinsche Klavieroeuvre ausmachen. Die vierte Sonate erweist sich als ein Werk von weitaus größerer Reichweite als die anderen und strahlt fast eine Art Gemächlichkeit aus. Das erste Thema des Moderato con moto ist zweiteilig: Mit einem stark rhythmischen Motiv, das mit Appassionato e con espressione bezeichnet ist und einem eher sanft aufsteigenden Thema, das von Triolenakkorden begleitet wird. Eine belebte Durchgangspassage führt zur zweiten Themengruppe: Einer lyrischen Melodie, die sofort erweitert und bearbeitet wird, und einer kleinen Coda mit weiteren zwei melodischen Ideen, von denen die zweite nach der Wiederholung der Exposition die Durchführung vorstellt. Alle Themen außer dem lyrischen zweiten stellen bedeutende Elemente der Durchführung dar, und das einleitende Thema wird fugal bearbeitet. Schließlich wird die gleichmäßige Reprise von einer kurzen Coda abgerundet. Das Scherzo ist von großer Ausdruckskraft, dessen Übermut im großen und ganzen nur von schroffen Kadenzen auf den Auftakten unterbrochen wird, und zuweilen sind sogar leicht experimentierende Dissonanzen vorhanden! Der ruhigere Trioabschnitt erinnert mit seinen zweitaktigen Phrasen und zarten Synkopierungen auf recht kuriose Weise an die Lyrischen Stücke Griegs. Die Melodie des langsamen Satzes ist sehr großzügig gestaltet—die Exposition besteht aus sieben hervorragenden Themen, von denen drei in der Haupttonart F-Dur gehalten sind, ehe ein eher munteres Thema im Fünfachteltakt und in Des vorgestellt wird. Eine Modulationsmelodie leitet zum zweiten Thema und einer Codetta in C-Dur über. Nun wird eine Themendurchführung mit den ersten melodischen Themen geplant, während in der Reprise dann Struktur und Tonalität neu variiert werden. Eine zweite Durchführung erweist sich schließlich als ein langer Abschied von der ersten Themengruppe. Das Finale ist ein sehr bewegtes Moto perpetuo, dessen Thema in Oktaven in der Baßstimme erschallt, ehe es der ersten einer Reihe von Transformationen unterliegt. Der kurze Versuch eines lyrischen Nebenthemas scheint an der beharr­lichen Rückkehr der ersten Durchführung zu scheitern, ein ausdrucksvollerer Abschnitt wird jedoch vor der Reprise vor­gestellt, in der das zweite Thema schließlich Auftrieb bekommt, ehe es Hals über Kopf abgeschlossen wird.